The Marangu route does however offer you the option of spending an extra acclimatization day on the mountain. 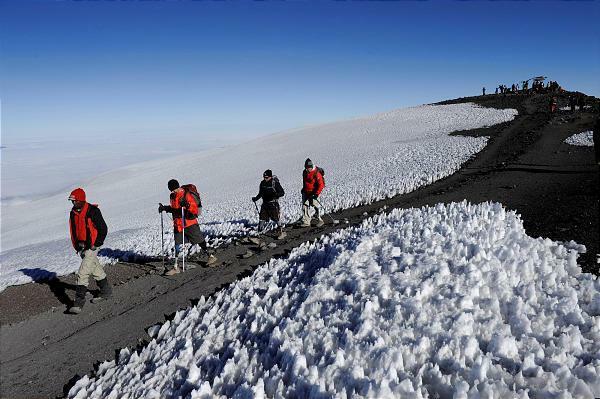 This extends the route into a 6-day trek, greatly increasing your chances of success. Shared hut accommodation on the Marangu route forms one of the main differences, compared to the other routes. It offers you the relative luxury of being able to sleep in huts along the entire route. Mineral water, soft drinks, chocolates and beers are also sold at all the camps on this route. All your equipment and supplies are pottered and a cook prepares all your meals. After Trekking Mount Kilimanjaro also this tour will take you to the Lake Manyara National Park:one of Tanzania’s most dramatically located wildlife areas, consisting of a shallow but huge soda lake, located at the foot of the Great Rift Valley’s western escarpment. The size of the park makes it perfect for a one-day game drive and is notably famous for it’s tree-climbing lions. Also this tour will take you to the Tarangire National Park, which features some of the greatest concentration of game in Tanzania – second only to the Ngorongoro Crater – but less crowded and unspoiled – possessing a wild and unkempt beauty. Finally this tour will take you to the Ngorongoro Crater and the Ngorongoro Conservation Area in Tanzania, featuring one of the highest concentrations of game and arguably the densest population of predators and carnivores in Africa. Here you will witness an amazing spectacle of African wildlife – inside a self-contained world teeming with animals. Duration of climb: 5 – 6 days. Day 01: Marangu Gate (1860m) – Mandara hut (2715m). The drive from Arusha to the Kilimanjaro National Park gate, takes about 1 hour. The journey passes through the village of Marangu, which is located on the lower slopes of the mountain. Once you reach the park gate, all hikers are requested to sign in at the Park office and make their final preparations for the climb. Porters will be seen arranging and loading their packs, containing the food, water, cooking gas as well as most of your equipment. Make sure that you have all your daypack items (containing at least drinking water, your lunch pack and extra clothing) with you, as the porters ascend a lot quicker than the hikers. Day 02: Mandara hut (2715m) – Horombo hut (3705m). Day 03: Horombo hut (3705m) – Acclimatization day. Day 04: Horombo hut (3705m) – Kibo hut (4730m). After breakfast you now continue your ascent into the Alpine desert habitat. From Horombo there are two trails to the “Saddle” (which refers to the area located between the peaks of Mawenzi and Kibo). There is an upper route (right hand fork) and lower route (left hand fork) to choose from. The upper route (right hand fork) should be very familiar, as you will have climbed most of it the previous day (on your acclimatization hike) towards Mawenzi hut. This section is very stony and eroded. Day 05: Kibo hut (4730m) – Uhuru Peak (5895m) – Horombo hut (3705m). Day 06: Horombo hut (3705m) – Marangu Gate (1860m). After breakfast you continue your descent (6 hours), passing the Mandara hut, down to the Marangu gate. It is strongly recommended not to pay your porters any tips until you and all your gear have reached the gate safely. Click here for more info on tips. At Marangu gate you sign your name and details in a register. This is also where successful climbers receive their summit certificates. Those climbers who reached Gillman’s Point (5685m) are issued with green certificates and those who reached Uhuru Peak (5895m), receive gold certificates. You now drive back to Arusha for a long overdue hot shower, dinner and celebrations!! Day 07: Arusha to Tarangire National Park. After breakfast from your requested accommodation, you will start your safari to southwest through Maasai steppe land to Tarangire National Park with picnic Lunch boxes. Picnic Lunch will be served at the picnic site where you will have a nice view of Tarangire River overlooking down the valley where most of the animals will be gathering drinking from the river. After Lunch you will proceed with game drives until evening when you will start drive to Karatu for Dinner and Overnight . Day 08: Tarangire to Lake Manyara National Park. After breakfast the tour departs. First stop is Arusha Town for any last minute purchases before we head off on safari. Afterwards we head to Lake Manyara. Lake Manyara National Park offers breathtaking views and a large variety of habitats. Acacia woodlands, water forests, baobab strewn cliffs, algae-streaked hot springs, swamps and the lake itself. And thanks to this the small Park is able to support a large number of animal species and incredible bird life. Manyara has the largest concentration of baboons anywhere in the world and the lions here are also renowned for their tree climbing.Drive back to Karatu for Dinner and Overnight. Day 09: Ngorongoro Crater to Arusha. After an early breakfast the tour will depart to Ngorongoro Crater. You will descend over 600 meters into the crater to view wildlife. The Ngorongoro Crater is the largest, unbroken and unfolded caldera in the world and it has an unbelievable diversity of wildlife. In addition to zebras and wildebeests, you might also spot the rare black rhino and other members of the “Big Five” – lion, elephant, buffalo, rhino and leopard. The crater is also home to other animals such as hyenas, water bucks, bush bucks, eland and more than 500 bird species. After an extensive game drive and a picnic lunch you will leave the caldera in the early afternoon and drive back to Arusha, where you will arrive in the early evening to your hotel or drive off to Airport. Accommodation before and during Safari. Hotel storage facilities for excess luggage during hikes. Camping equipment (tents, sleeping mat, camp chairs), camp tables, mess tent & cutlery for meals) – not applicable on the Marangu route as all meals are served at the camps in designated dining halls.